Berlin-based artist Philipp Artus speaks at the Phillips on May 11, and his work will be featured at the 2017 Contemporaries Bash: Berlin Underground. We asked the artist a few questions about his process and his work at large. Read Part 1 of the interview here. I read that you take inspiration from Miles Davis. How do you go about deciding how to incorporate sound in your work? Do you have a background in music? I learned to play some instruments as a kid, but I was generally more interested in drawing and photography. However, when I started studying art, I was immediately fascinated by the creative possibilities that open up through time-based art forms, like playing with rhythm, repetition, and variation. My first experiments in animation were purely intuitive, but at some point I felt the need to really understand the underlying principles I was using. Therefore, I studied Newton’s laws of motion, and also got interested in music theory, since I found that many principles of music can be applied to animation. You mentioned Miles Davis, so let’s take him as an example. While a lot of Jazz musicians of his time were into the Bebop style, which was characterized by fast tempo and complex chord progressions, Davis was going in the opposite direction: he slowed down the pacing and concentrated more on the horizontal flow of the melody, which eventually became known as Cool Jazz. I found that most educational books about animation give the advice to concentrate on “poses.” You would start with a particular position of a figure, then think about the next positions some frames later and so on. This “vertical” thinking about time usually leads to quick successions of character poses—which is similar to the fast chord progressions in Bebop Jazz. Miles Davis inspired me to develop a form of animation that focuses more on the horizontal flow of the movement and also to trust in the beauty of simplicity. This example is a bit technical, but it gives you an impression of how my interest for music inspires my work. Music is essentially the art of structuring movement, which is very similar to animation. Your current work is primarily film and animation. Have you spent any time in other mediums? If so, how does this influence your work? During the last two years I developed a new series of light drawings, which is the first time since the beginning of my art studies that I have worked on a “static” medium. In this series I take snapshots of the moving lines generated by the FLORA algorithm, and choose some images that become part of the light drawings series. To create these images I developed a unique printing method that combines analog photography and a laser projector. The resulting images show the traces of abstract movement frozen in time. The photographic chemicals I am using are heavily influenced by the weather and the paper. 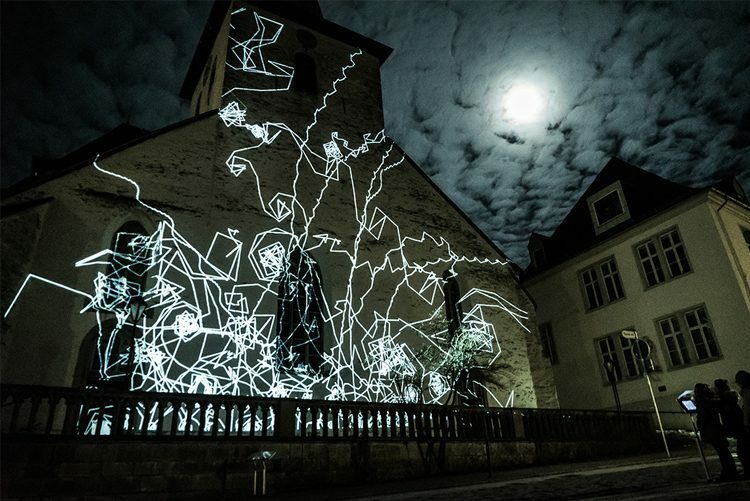 So, in a way, this series of light drawings puts me back into the material world, which is beautiful. There are tons of artists who inspire my work, and it is always difficult for me to choose just a few. 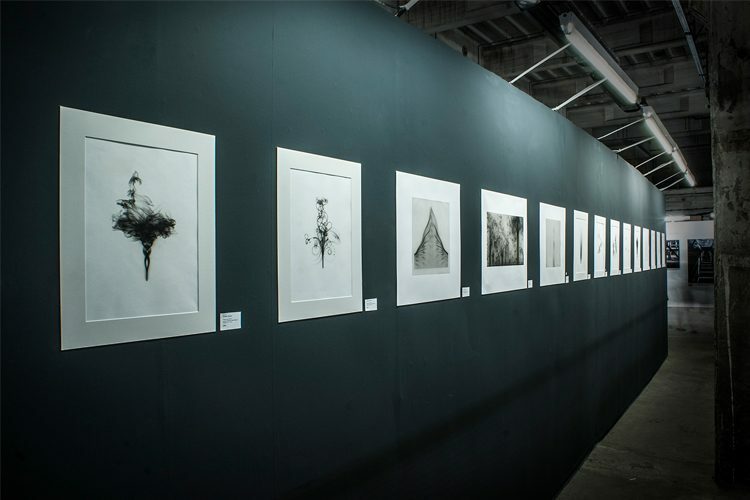 Two important inspirations for the FLORA light drawings I just mentioned were the plants by Karl Blossfeldt as well as the lightning fields by Hiroshi Sugimoto. Both of these photographic works are an observation of nature that avoids any kind of self-expression. This approach to art is quite far away from the selfie-obsessed society we are living in and is therefore refreshing. However, the initial inspiration for FLORA was not a particular artist, but rather the movement of my cat’s tale. It made me realize that a simple chain of rotating joints can create a fascinating and elegant motion. Your works are heavily digital. As younger generations that grew up with technology enter into the art world, what do you think is the future of digital tools as medium? I would not say that my works are heavily digital. 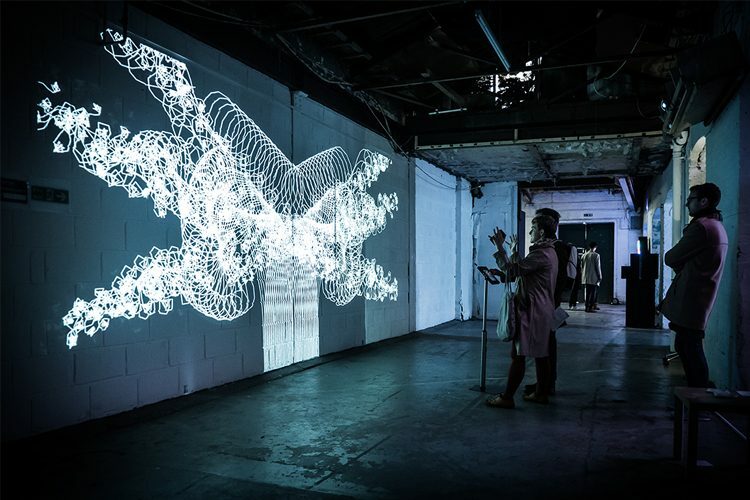 If you take my FLORA light drawings as an example, the shapes are generated by an algorithm in a purely digital way. 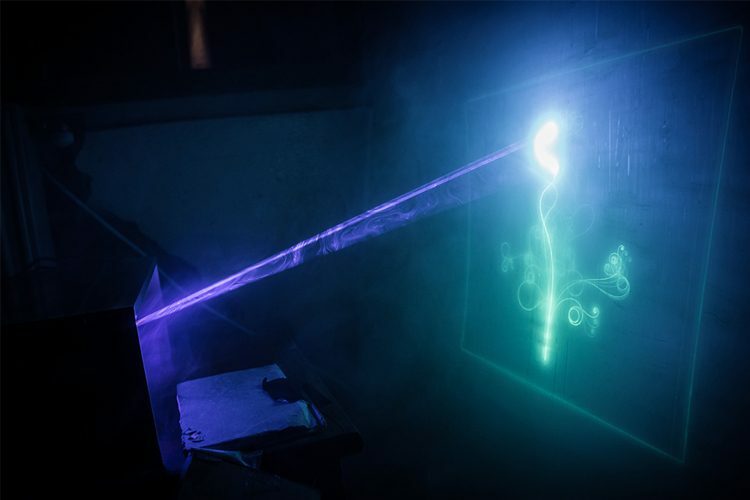 But to create these images I am using an analog laser projector in combination with the chemicals of analog photography. So it is rather the interplay between digital and analog technology that I am interested in. I think that there are quite a few artists in my generation who are interested in this dialogue between old and new media. It seems that the more we are surrounded by digital images and sound, the more we value the materiality and “aura” in analog media. 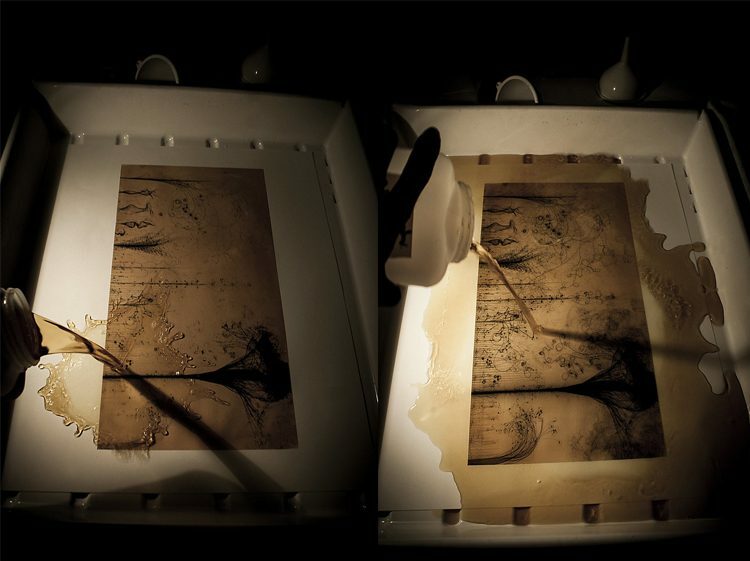 Also, digital technology makes us rediscover old technologies in new ways: The photographic process that I am using in my light drawings is called Platinotype and was invented in the 1870s. Many artists of the Pictorialist movement used it at that time, but obviously back then they neither had computer algorithms nor laser projectors. Berlin-based artist Philipp Artus speaks at the Phillips on May 11, and his work will be featured at the 2017 Contemporaries Bash: Berlin Underground. We asked the artist a few questions about his process and his work at large. Tell us a little about yourself. When did you first begin pursuing the arts? I grew up in Bremen, a German city close to the North Sea. After school I moved to Nantes in France to study art and experimental film. I then spent one year in Portugal with a cat to learn about character animation and its relation to sound and music. Later I continued my studies of Media Art in Cologne/Germany, where I developed an interest in site-specific installations. After graduation I moved to Berlin, where I have lived and worked since 2013. I often start with an idea and let it develop its own life, so that I can follow it. Thus, when I am working on a project I never really know where the idea will take me. I need this sense of discovery to keep me excited throughout the project. This curiosity makes me get to know various different artistic fields and sometimes allows me to draw unusual connections between them. One example for this working style is my most recent project FLORA. I started to learn text-based coding from scratch about two years ago. At first it felt like I was going nowhere, but after a while I learned how to combine my knowledge about animation with the principles of computer programming. 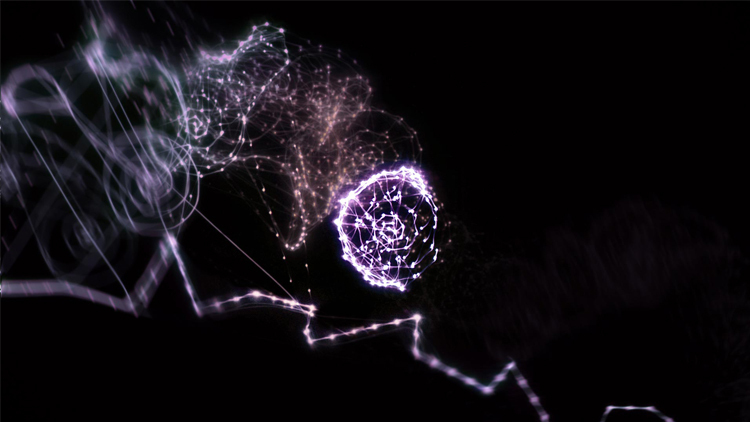 The result was the installation FLORA, which is a combination of animation and algorithmic art. I think it is this mixture of different artistic fields that characterizes my work and makes it unique. Do you have any recurring themes you like to play with in your work? Life is a recurring theme in my work that I like to play with. The word animation originates from the Latin word “anima”, meaning “give life to.” In my work I am exploring animation, which is essentially the expression of life through movement. Due to this connection to life, even my most abstract works have a figurative spirit. Also, I often like to create dialogues of oppositions: a fast-paced film can simultaneously feel slow and meditative. A serious topic might be mixed with whimsical and absurd ingredients. A timeless theme can be combined with playful quotations of popular culture… I like surprising myself and the viewer, and challenging our preconceived ideas and stereotypes. Read Part 2 of our interview with the artist here. Pousttchi’s Double Monuments at the Phillips soar toward the ceiling as Tatlin’s did, but his model was symbolic of larger things to come. If constructed, his glass and iron sculpture would have been 1,300 feet (about 300 feet taller than the Eiffel Tower). The model was meant to promote “the collective” and (re)establish the visual culture of Russia. Pousttchi’s Double Monuments aren’t necessarily commenting on that idea, but much of their power and meaning is drawn from that history. Pousttchi uses Dan Flavin’s trademark fluorescent tubes to expand that history. In the 1960s, American artist Dan Flavin utilized neon tubes to explore minimalism and the role of art in the gallery. Interestingly, he created a series responding to Tatlin’s monument. Pousttchi disrupts Dan Flavin’s minimalist language and places fluorescent tubes within bent metal crowd barriers. 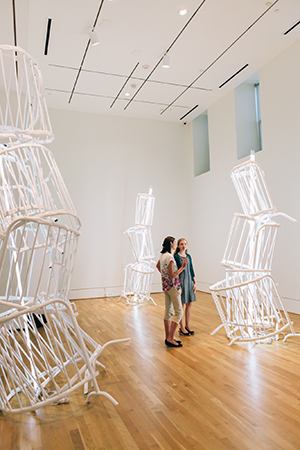 She simultaneously comments on Flavin’s homage and removes a key element of Flavin’s works; her fluorescent lights are not alone in a gallery space as Flavin’s are, but rather are enveloped by the skeleton of Tatlin’s monument. Tatlin sought to usher in a new era of Russian visual culture and politics. Flavin was attempting to disrupt the idea of the gallery. Pousttchi comments on history and the work that came before to explore her own ambitions and artistic practice.